Fully Equipped Professional Marijuana Infused Products Facility #2103B | Front Range Business, Inc. According to Cannabis Business Times and Cannabis Business Executive, concentrates make up the most vibrant category in the retail marijuana industry, with sales growing as much by 83.9 percent during 2016, continuing with strong growth of 37% in 2017, and expected to continue growing as cannabis users increasingly opt for the discreet and popular vape pens. This Marijuana Infused Product (MIP) business opportunity offers a fully-equipped entry into this growing market category. It is housed in a beautiful, brand new, state-of-the-art, Div 1/Class 1 facility with an office and walk-in vault. Seller recently invested almost a half million dollars in upgrades and new equipment that produce wax, shatter, butters, and oil. 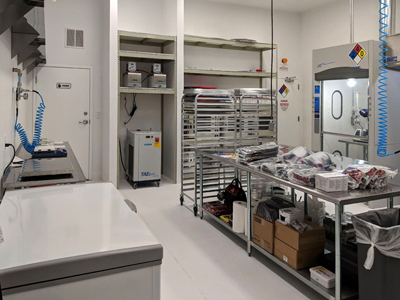 This facility’s new state-of-the-art equipment includes an Extraction Tek Solutions MEP 30 extraction machine with a Haskel recovery pump, 2 Labconco fumigation hoods, a rotary evaporator, 2 vacuum ovens and pumps, a commercial kitchen hood with induction range capabilities, a refrigerator, a freezer, a rosin press, ample work surfaces and much more. The 3,000 square foot floorplan is designed for maximum flexibility and includes everything needed to extract 15 pounds in 45 minutes. It includes both medical and recreational MIP licenses. The MIP is staffed with experienced professionals who are skilled in top quality concentrate extraction, including an operations manager, extraction manager, extractor, administrator, and production and sales staffs. Don’t miss this opportunity to buy into this fast growing business niche. Represented by Joel Russman. Tell me more about this business.